We would like to extend extend a sincere and warm thank you to Professor Rod Ellis who journeyed all the way to Kochi to discuss his views on task-based language teaching. This East Shikoku JALT event attracted over 100 educators who traveled from Tokushima, Ehime, Kagawa, and Hiroshima. A video tape of Professor Ellis’ talk will be posted soon and his slide presentation is available in PowerPoint or HTML format. design of task-based courses and the methodology for implementing tasks in the classroom. The second part will present my rationale for task-based language teaching (TBLT). I will argue that the development of the implicit knowledge of a second language that is required for effective communication is best achieved by engaging learners in performing tasks. That is, learners can develop their communicative competence (including linguistic competence) through performing tasks, especially if the performance of the task entails attention to linguistic form. assumptions underlying their criticisms will be examined and a response provided. The fourth part will address more substantial problems with implementing TBLT in school classrooms, especially those in foreign language contexts. Again, I will suggest a number of possible solutions to these problems. Rod Ellis is currently Professor in the Department of Applied Language Studies and Linguistics, University of Auckland, where he teaches postgraduate courses on second language acquisition, individual differences in language learning and task-based teaching. 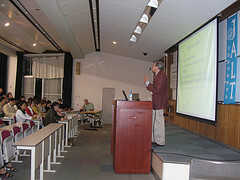 His published work includes articles and books on second language acquisition, language teaching and teacher education. His books include Understanding Second Language Acquisition (BAAL Prize 1986) and The Study of Second Language Acquisition (Duke of Edinburgh prize 1995). More recently, Task-Based Learning and Teaching early (2003) and (with Gary Barkhuizen) Analyzing Learner Language in (2005), were published by Oxford University Press. He has also published several English language textbooks, including Impact Grammar (Pearson: Longman). He is currently editor of the journal Language Teaching Research. In addition to his current position in New Zealand, he has worked in schools in Spain and Zambia and in universities in the United Kingdom, Japan and the United States. He has also conducted numerous consultancies and seminars throughout the world.